When you arrive, you’ll find ample parking outside and a wheelchair-friendly branch. 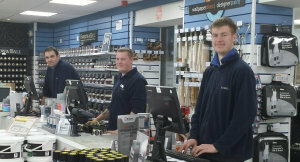 Inside there’s the usual wide range of wallpapers, trade and designer paints, decorating sundries, tools and equipment. We’re a good-humoured group who enjoy our work and our regulars know they can count on us for expert product insight. We can help trade and retail customers with all enquiries, and if you can’t make it into branch we can arrange for delivery locally. 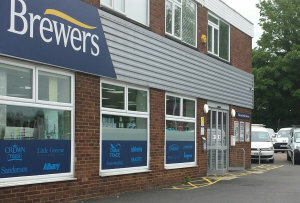 Brewers Decorator Centre in Bletchley is one of two in Milton Keynes; the other is our Alston Drive branch, which serves customers to the north of Milton Keynes. Our Bletchley branch is on your left, 100m down Bilton Road from Watling Street (look out for the turning by the Citroen garage) and about 200m from Bletcham Way, via Bond Avenue. Coming off the A5 onto Watling Street, continue straight through the High Street and take the next turning on your right onto Bilton Road. Continue round to the left on Bilton Road to find the store on your right.